At InfoComm 2015, Blonder Tongue, a leading manufacturer of SD and HD digital video solutions, will showcase its next-generation HD and Ultra HD 4K Solutions, QAM/IPTV transcoders, and MPEG transport stream analyzers, all designed to optimize television distribution. At the InfoComm Show, Blonder Tongue will highlight its FlexCoder, a versatile new solution that offers a wide-range of functionality and brings remarkable cost savings. It operates in three different modes (Basic; Demux; Mux) with an optional RF input board, which in a variety of ways converts IP video streams into QAM and ASI and translates 8VSB, clear QAM, or ASI to IP. All modes will support the three audio formats: AC3, AAC, and MPEG-1 Layer 2. The FlexCoder is capable of accepting IP streams (4 MPTS or 32 SPTS), one ASI and one optional 8VSB/QAM inputs. After accepting video content, the FlexCoder de-multiplexes MPEG-2 or H.264 MPTS to SPTS and simultaneously multiplexes MPEG-2 or H.264 SPTS to MPTS on the IP and/or QAM outputs. The optional input board can receive one off-air or clear QAM channel. By using the comprehensive web-based management portal, the operator can locally or remotely customize device functionality to pass through or modify PSIP information such as major/minor channels, short names and corresponding program IDs (PIDs). The user interface allows for null packet insertions or deletion supporting VBR and CBR, UDP Uni-cast or Multi-cast support along with UDP delivery of IP packets. Blonder Tongue will also showcase its latest Video Virtual Showroom (VS) products including the new Ultra HD 4K Modulator, Ultra HD 4K Decoder, as well as its off-air transcoder and live-action encoder offerings. Building on the company’s strengths in IP streaming, the products offer future-proof options to simultaneously deliver QAM signals to digital TV sets, while also delivering IP video to computer networks and displays. The Virtual Showroom supports all video resolutions, from SD to 4K/UHD, encoded in MPEG-2, MPEG-4 (H.264) and HEVC (H.265) formats. It can distribute video over an existing RF coax network or over an IP network to a single TV or an entire wall of TVs – there is really no limit to VS scalability. The VS is ideal for all types of retail application that leverage video content, such as auto showrooms, bars and restaurants, clothing stores, electronic retailers, and more. These system solutions accept SD, HD, UHD MPEG-2, H.264, or H.265 content with source delivery via satellite, internet, a private network or CDN. Store architectures include all IP system or QAM/RF. Products showcased in the Blonder Tongue booth 5953 will include 4K Ultra HD Modulator and Decoders, LiveCastUHD HEVC/H.265 Encoder, MPEG-2 and H.265 Encoders, as well as Off-Air Transcoder AQT8-QAM/IP. At InfoComm15, Blonder Tongue will demonstrate its latest IP encoders – HDIP and LiveCast. Each unique in performance and functionality in their own way provide users with cutting-edge methods to distribute HD IPTV and content acquisition SDI encoding for in-house digital signage and broadcast in facilities such as studios, casinos, airports, and arenas. The HDIP is a small form factor low-cost encoder ideal for encoding high quality MPEG-2 or H.264 video from SDI broadcast source. The unit is capable of encoding two IP streams of the same content in either HD or SD formats. The unit is a stand-alone unit, but can be mounted horizontally to support three HDIP encoders in a 1 RU housing or twelve HDIP encoders can be vertically mounted in a 5 RU chassis. The HDIP is scalable, flexible, and reliable for mission critical real-time video distribution. For video not residing at your facility, our LiveCast encoder can provide a cost-effective way to transport remote video feeds to your facility for in-house distribution while still maintaining high video quality. The LiveCast can encode your SDI live source at a remote location and transport your content over the public internet to your in-house facility then to your video media platform. The combination of Blonder Tongue’s broadcast quality encoding engine and Zixi’s video-optimized protocol provides the ability for enterprise networks to transport high quality video over the public internet or unmanaged networks at a low cost compared to traditional methods. Blonder Tongue will also showcase the recently introduced (at the 2015 NAB Show) HDDM and HDDM-SDI, High Definition Decoder Modules. These low-cost professional decoders are capable of decoding off-air, clear QAM, and IP content and deliver in component, HD-SDI, and HDMI which is ideal for digital signage applications, video link receive sites, or broadcast monitoring. The HDDM decoders are capable of accepting up to one off-air or clear QAM and one IP stream to simultaneously deliver MPEG-2 and H.264 content in one component and one HDMI outputs. Both units support closed captioning. By using the comprehensive web-based management portal, the operator can locally or remotely customize device functionality of variable bit rate (VBR) and constant bit rate (CBR) video streams, UDP and RTP protocols, Uni-cast or Multi-cast, and IGMPv2 and IGMPv3. The HDDM or HDDM-SDI is rack mountable two across in 1RU. At InfoComm, Blonder Tongue will demonstrate its wide variety of product offerings that provide a cost effective way for operators of Private Video Networks to migrate from analog to an all-digital HD solution. By using a combination of Blonder Tongue products such as AQT8-QAM/IP, HDE-8C-QAM/IP and local encoders the operator has the ability to create a custom QAM or IP lineup. 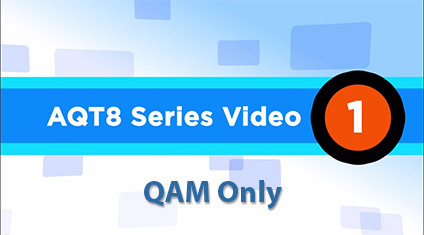 The Blonder Tongue AQT8-QAM/IP provides the user the ability to acquire digital HD content from local off-air sources. The unit demodulates up to eight off-air terrestrial RF signals supporting up to 20 programs on the IP output, while simultaneously mapping the off-air sources to QAM output channels. The HDE-8C-QAM/IP is a content acquisition encoder that allows the user to re-encode digital HD content from their service or satellite provider. The unit accepts up to eight programs from component or composite inputs. The content is MPEG-2 encoded and outputs QAM or IP. Local content can be added with single or multichannel encoder that supports an array of input interfaces. 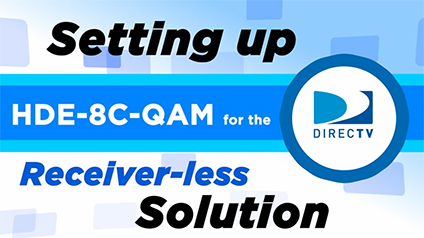 These products provide a solution for operators of commercial networks to create a unique QAM or IP lineup for in-house digital HD distribution. At InfoComm, Blonder Tongue will be demonstrating new features added to the popular MTSA-PRO. Two notable device functions; first is a tuning feature to show what channels are available, and second is the off-air scan feature so users can see levels – great for site-surveys. The MTSA-PRO MPEG transport stream analyzer, designed to help operators and technicians understand what is going on inside their digital transmission. 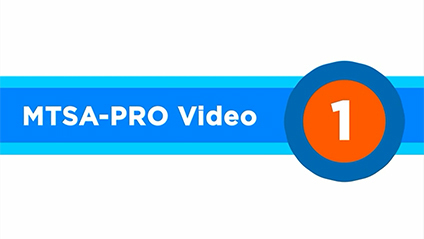 Utilizing the compact device, users can capture, analyze, and generate MPEG ASI transport streams to troubleshoot problems from outside sources and ensure the best digital delivery. The MTSA-PRO supports RF, IP and ASI input sources and has an ASI output. By enabling real-time analysis, monitoring, and decoding of transport streams, the software-based solution helps reduce transport stream issues and ensure superior video quality. “Safe Harbor” Statement under the Private Securities Litigation Reform Act of 1995: The information set forth above includes “forwardlooking” statements and accordingly, the cautionary statements contained in Blonder Tongue’s Annual Report and Form 10-K for the year ended December 31, 2014 (See Item 1: Business, Item 1A: Risk Factors, Item 3: Legal Proceedings and Item 7: Management’s Discussion and Analysis of Financial Condition and Results of Operations), and other filings with the Securities and Exchange Commission are incorporated herein by reference. The words “believe”, “expect”, “anticipate”, “project”, “target”, “intend”, “plan”, “seek”, “estimate”, “endeavor”, “should”, “could”, “may” and similar expressions are intended to identify forward-looking statements. In addition, any statements that refer to projections for our future financial performance, our anticipated growth trends in our business and other characterizations of future events or circumstances are forward-looking statements. Readers are cautioned not to place undue reliance on these forward-looking statements, which reflect management’s analysis only as of the date hereof. Blonder Tongue undertakes no obligation to publicly revise these forward-looking statements to reflect events or circumstances that arise after the date hereof. Blonder Tongue’s actual results may differ from the anticipated results or other expectations expressed in Blonder Tongue’s “forward-looking” statements.